Srinagar, July 21 – The Yatra to the Holy Cave Shrine of Shri Amarnathji is progressing smoothly and 9433 Yatris performed darshan on Monday. According to a Spokesperson of the Shri Amarnathji Shrine Board, 1994 pilgrims left from the Baltal Base Camp and 2302 from the Nunwan Base Camp this morning on their journey to the Holy Cave Shrine. He stated that another batch of 729 Yatris left from Jammu to the Pahalgam and Baltal Base Camps today. Minister of State for Tourism Mr. Nasir Aslam Wani during interaction with deputation from Pulwama. Srinagar, July 21-Minister of State for Tourism, Urban Development, PHE and Revenue and Relief, Mr. Nasir Aslam Wani has reiterated government’s commitment to tap the uncovered tourist destinations of Jammu and Kashmir. He said that the state has a great potential of varied tourist destinations and the need of the hour is to focus on these new destinations by providing world class tourism related facilities to the tourists. The Minister was interacting with a deputation from Pulwama led by Ghulam Nabi Rattan Puri. The deputation asked the Minister to bring Nagibarem, Shikargah, Tarsar-Marsar lake, Suinar and Zesibal on tourism map of Jammu and Kashmir. They also demanded to upgrade the irrigation facilities at Padgampura Ladhan and renovation of Kowkhal, canal. The Minister said that the Tourism department has already taken initiatives to provide better tourism related infrastructure facilities to the uncovered tourist destinations for which 19 Tourism Development Authorities have been set up to cover these destinations and many more such steps are in the offing to bring other areas also on the tourism map. 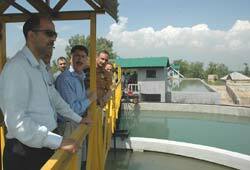 Regarding upgradation of irrigation facilities at Pulwama and its adjacent areas, the Minister assured the deputation that he will take this matter with the concern ministry.